Collision Literary Magazine at the University of Pittsburgh is currently looking for submissions of undergraduate fiction, nonfiction, poetry, and art! Founded in 2001, Collision Literary Magazine publishes undergraduate writing and art not just from the University of Pittsburgh, but from all over the world. 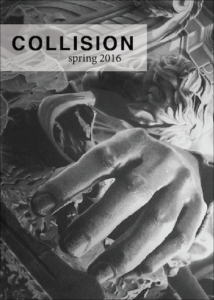 Collision accepts fiction, creative nonfiction, poetry, and art, with a particular interest in work that challenges style and structure. It is a student-run publication funded by the University Honors College. To submit to the magazine, students must send submissions to collision.pitt@gmail.com with their student email, class year, and genre. Submissions close Friday, Feb. 22, but are read on a rolling basis. You can find more information about the magazine and their submission guidelines at http://collision.honorscollege.pitt.edu. If you have any questions, please contact collision.pitt@gmail.com.